Ohio Gov. 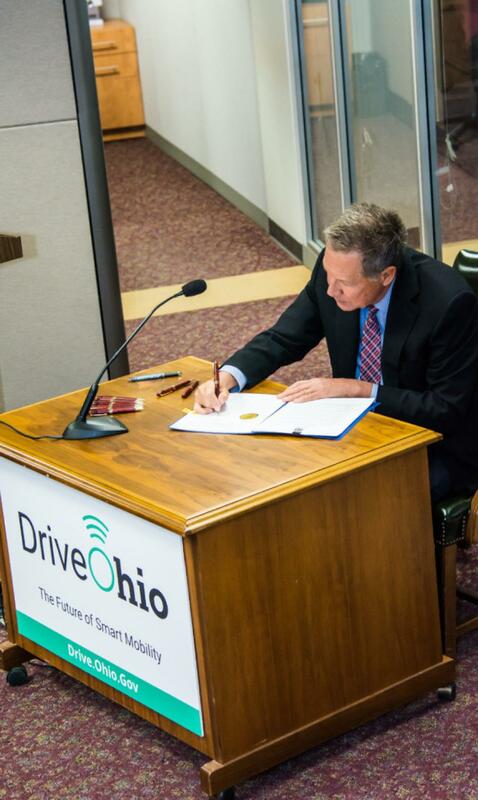 John R. Kasich signed an executive order creating a one-stop shop that will make it easier for researchers to advance connected and autonomous vehicle technologies. The new center, DriveOhio, will bring together those responsible for building infrastructure in Ohio with those who are developing new transportation technologies to better coordinate efforts and connect transportation providers with automotive and equipment manufacturers. Initially, DriveOhio will be housed within the Ohio Department of Transportation. In order to ensure the center is meeting the needs and keeping up with innovations in the industry, an expert advisory board will be created. The board will include leaders in the automotive, telecommunications, software development, insurance, data, cyber security industries, as well as researchers and developers, among others. As a first step, the department issued a Request for Proposals asking teams of engineering, technology and data companies to compete for a contract to develop a statewide technology and data framework for its smart mobility initiative. The executive order also calls upon the Department of Transportation to begin outfitting its fleet vehicles with devices that that can start tracking data that will be beneficial to advancing connected-vehicle research. Last year, Ohio announced the creation of new smart highway projects to complement its transportation research corridors along the Ohio Turnpike and a 35-mi. stretch of U.S. 33 in central Ohio. Portions of Interstate 670 in Columbus and Interstate 90 in northeast Ohio are being outfitted with advanced technologies aimed at helping innovators refine systems for connected and autonomous vehicles. Ohio's transportation budget signed by the governor in 2017, together with commitments from the federal government and other partners, is investing $45 million for expanded research capabilities at the Transportation Research Center in East Liberty — North America's most advanced independent automotive test facility and an ideal environment for autonomous vehicle and smart highway research.